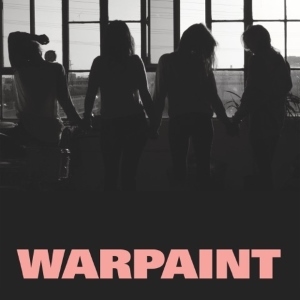 For the bands third album Warpaint, the art-rock group from LA have made a decidedly more mainstream move amping up the dance quotation, moving from the rock world into disco club land. While Heads Up isn't a raver, it is an interesting mid career re-branding that brings with it some pleasure and a few dull tracks. Emily Kokal,Theresa Wayman, Jenny Lee Lindberg, and Stella Mozgawa are the four band members and they announced this album would reflect more of the current R&B and Hip-Hop scene and while there are hints here, it just seems the band was angling for more mainstream, catchy, less angular tunes. There was a hinting at this directional shift on the bands last self-titled release as a distance was created to go along with softer, safer songs. Here the foundation is laid at the beginning with "Whiteout" as the players work with skittering beats, thumping bass and dance vibe. The electric samples and murky backing take over for "By Your Side" while "So Good" has a moaned wordless coda over heart pulsing sounds. Unfortunately this style is all blended together and there are a lot of tracks that don't leave much of a lasting impression and just drip away, such as the bubbling "Don't Wanna" or the soundscape experiment "Dre". The best effort in their new sound and style comes from the very 80's influenced single "New Song" with its party all the time feel of moving outward and upward. Other positives are the spacey guitars pairing with excellent drums on "The Stall" and the confident "Don't Let Go" which works with an acoustic intro up into dramatic swells. In the end the album is a fine transition for the band, but not very exciting of a listen. Dipping their feet into the electronica/dance world could make for a more dynamic follow up or maybe they will switch styles again next go round.